TorrentRover is a simple portable tool that lets you search and download torrent files from multiple trusted torrent sites. It is very simple to use and offers many powerful options as well. TorrentRover is an application developed to help you find torrents without having to open your browser and search multiple websites for the same thing. With this tool you are able to scan all the popular torrent search engines at the same time and locate what you’re looking for in a much simpler and faster way. No installation is required to use this tool. What makes TorrentRover the best? 3. Choosing the best result is easy (keyword highlighting, points, ratings, filters, and user comment support). 9. Weekly Rovers (One search to automatically get weekly TV shows, webisodes, podcasts) 10. Automated downloading by point limits (Great for weekly Rovers). Right off the bat, Portable TorrentRover won’t strike you as a complicated piece of software. If anything, its GUI layout showcases the exact opposite. It’s comprised of an easy to make out icon and menu toolbar along with two sections for viewing the search keywords and the results with various details. In case you want to perform multiple downloads at a time, Portable TorrentRover enables you to filter the tasks by status, action, timing and category. This in turn makes it that much easier to manage content and prioritize. TorrentRover enables you to create Rovers which can be scheduled to perform a search based on certain parameters and filters. Adding a Rover means telling the application what to search for, in which category it belongs, how often to check, which search engine to look in and under what format can the file be found. It’s a simple task which anyone who has some basic torrent downloading knowledge can perform with guaranteed success. Moreover, if Portable TorrentRover manages to locate the file you are looking for, it gives your torrent client the nudge to download it. 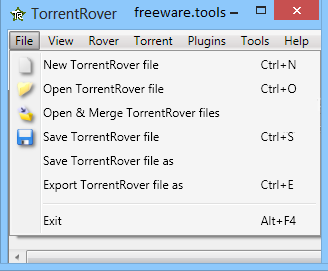 One thing you should be aware of at this point is that Portable TorrentRover isn’t a torrent downloader. With this tool you are able to locate files but to grab them you do need to have a torrent client installed on your computer. To wrap it up, Portable TorrentRover is a very handy tool to have on your computer if you don’t want to waste time looking for torrents on various websites.